The Minnesota-based poets will be hosted by the Department of English for a free, public reading on Thursday, March 21. Two up-and-coming poets will give a free, public reading at Gustavus Adolphus College on Thursday, March 21, at 7 p.m. in the Linnaeus Arboretum’s Melva Lind Interpretive Center. 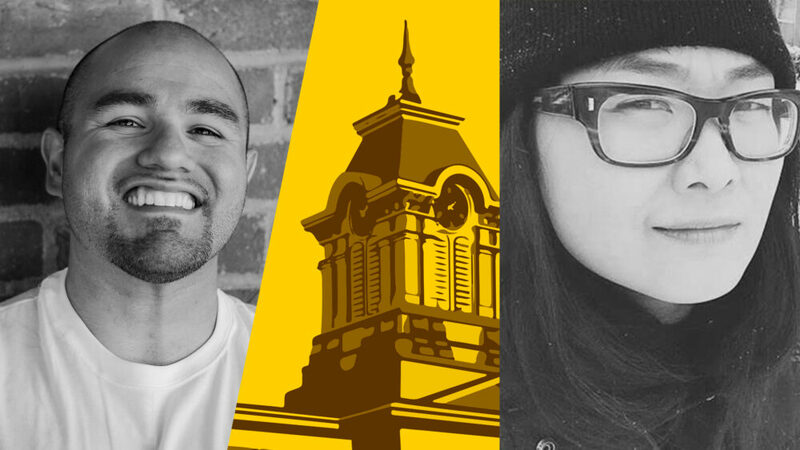 Hosted by the Gustavus Department of English as part of the Bards in the Arb Series, Thursday’s event will feature Minnesota poets Su Hwang and Michael Torres. Hwang, who was announced this week as the winner of a $40,000 fellowship from the Jerome Foundation in St. Paul, is the author of Bodega, a forthcoming poetry collection published by Milkweed Editions. Torres was recently announced as the recipient of a $25,000 National Endowment for the Arts fellowship. A creative writing teacher at Minnesota State University, Mankato, his work has been widely published in literary journals including Ploughshares, Water~Stone Review, and The Georgia Review. Both Hwang and Torres draw on experiences from their own lives to inform their work. Hwang was born in Korea and has lived in New York City and San Francisco, while Torres was born and raised in Pomona, Calif., where he spent his youth as a graffiti artist. Today, both poets call Minnesota home and teach through the Minnesota Prison Writing Workshop.